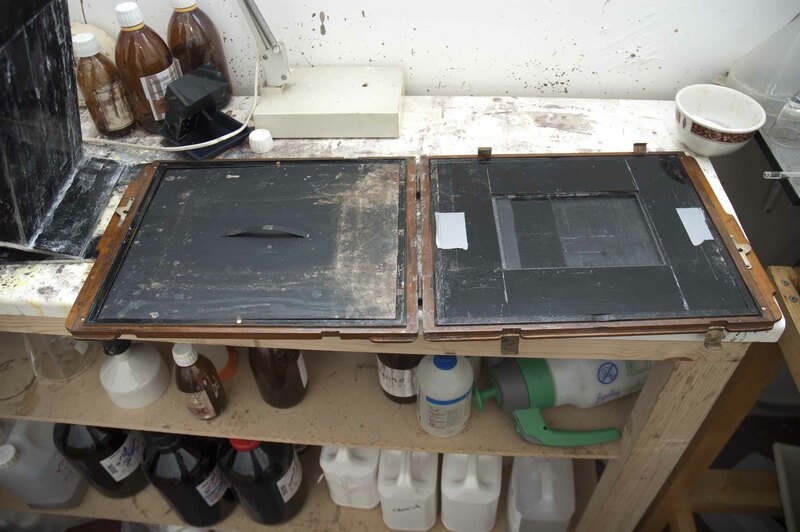 Collodion Workshop (part one). 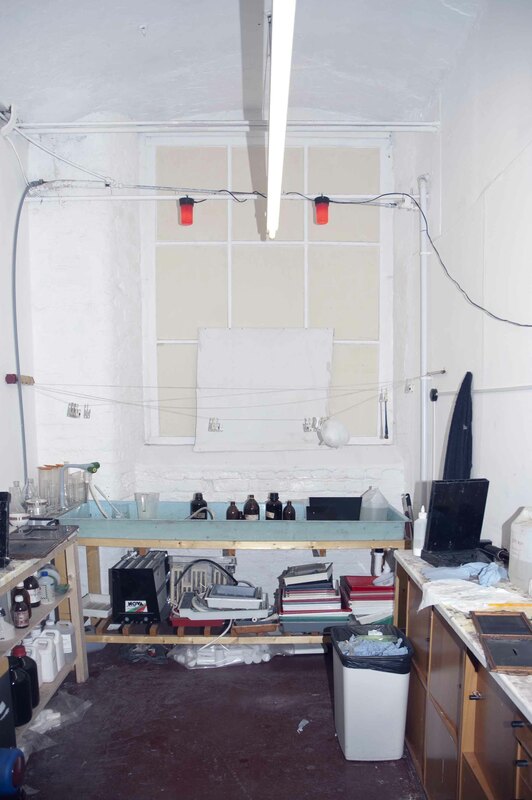 | Documenting Alternative and Historical Photographic Processes. 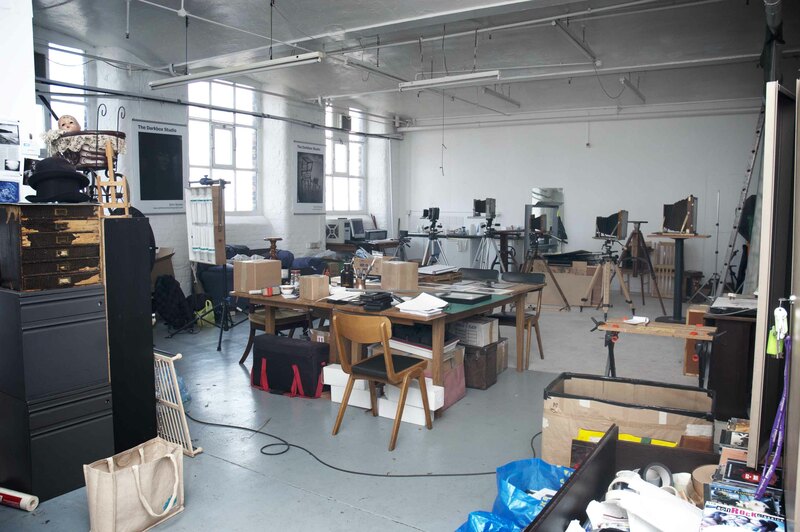 Documenting Alternative and Historical Photographic Processes. « Focus on Imaging 2012. 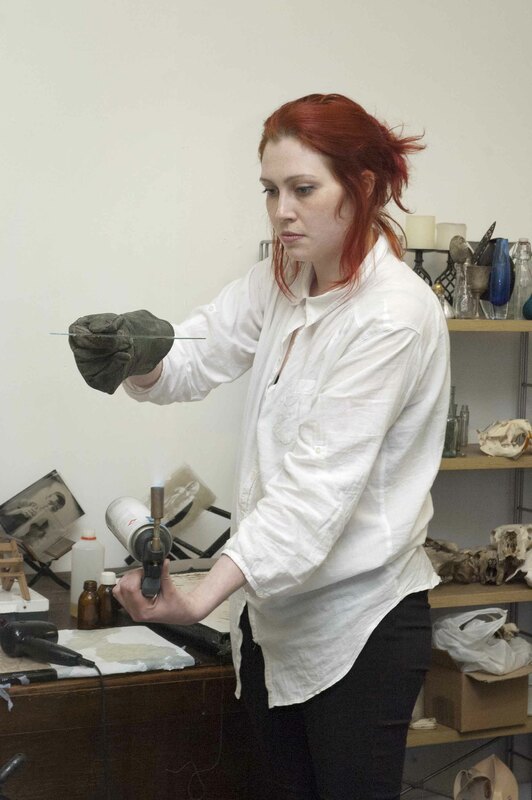 Recently I have had the opportunity to take part in a Collodion Workshop with John Brewer, an expert in the process having using the process for over 5 years. I think it is a very valuable way of learning through the process of doing especially when using such dangerous chemicals as Potassium Cyanide and Silver Nitrate. Alan Duncan, a professional photographer and tutor at Loughborough University and Ben Dolman who is also a tutor at Loughborough University were also to take part in the two day workshop, and I can say on behalf of us all the experience was a exciting and inspiring one. As I have talked about before in previous posts, the experience of almost crafting the photograph, asserting control over so many other aspects of the process than just the aspect where you point the camera and expose the surface. This assertion of chemicals to the surface, controlling the flow of certain elements of the process combined with the concoction of smells heightens the experience and conceptual elements of object that is forged at the end of the process. During the workshop, John Brewer’s assistant was able to record some of the stages of the process as we were doing them. 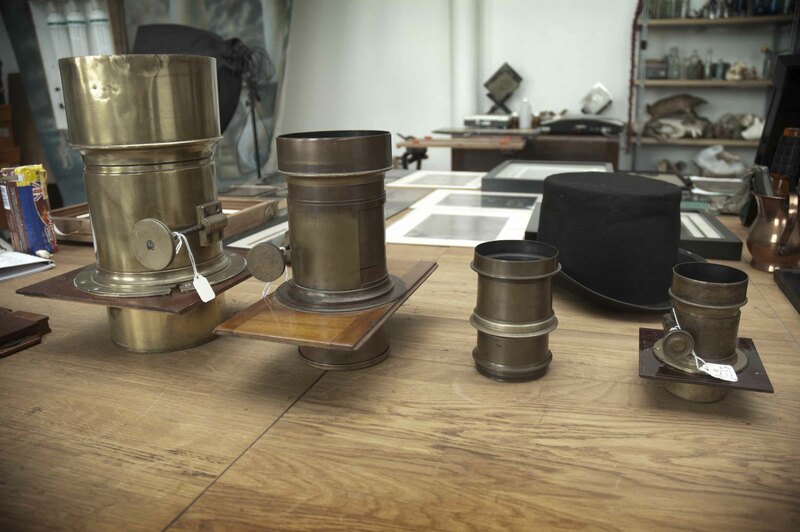 The workshop began with an explanation of the process equipment and types of lenses that we would be using, as well as some from John’s own collection. We were given a manual on the process detailing everything from health and safety to lenses diagrams and photographs of the process in action. The Camera, a 12x 10 Vageeswari camera. 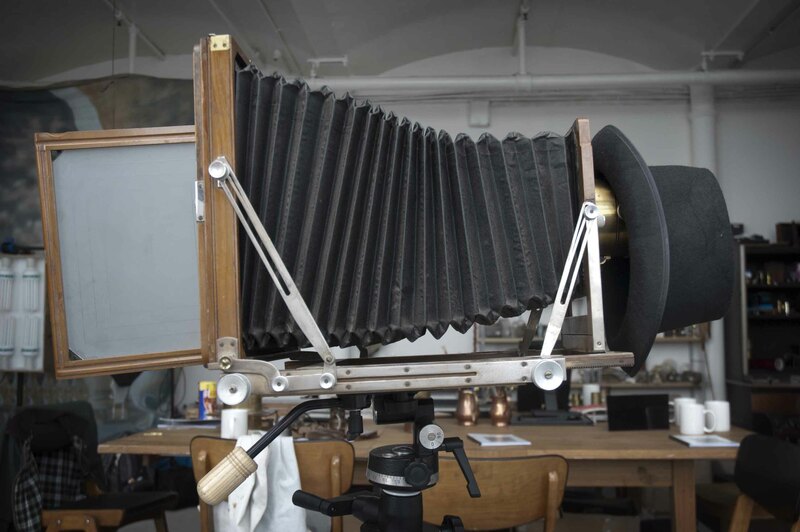 Double dark slide for the wooden 12×10 camera. A dark slide that come in book form, here is shown to have a black acrylic insert to fit different sizes of glass. 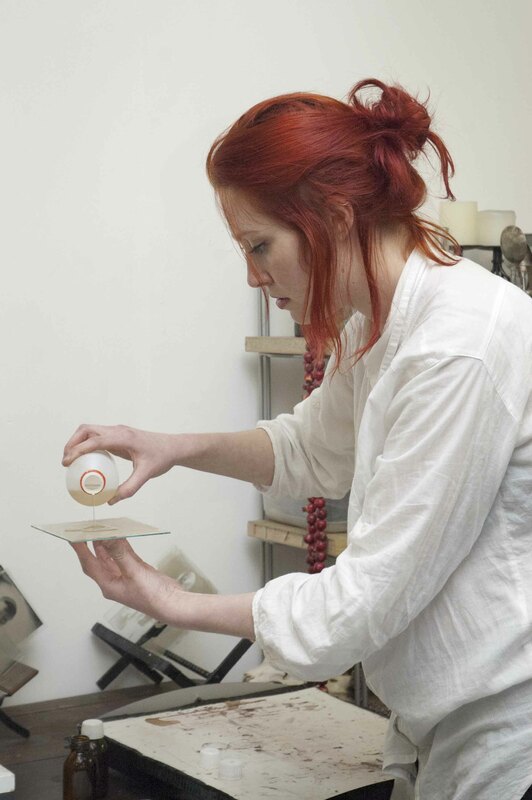 After we had had a run through verbally of the process we were firstly given a demonstration by John, I began to realise the steps in my own practise up to now with Collodion. Firstly came cutting the glass and cleaning it. The glass cutter used was Toyo glass cutter and unlike other cutters I had used previously was able to cut off small sections of glass, the cuts were a lot cleaner and the cutter was generally more efficient. Cleaning the glass I realised was something that need to be done incredibly throughly not to leave residue of the glass cleaner on the plate which will hinder the final image. So a lot of buffing the plate is needed here, a lot more than I had previously thought, it was definitely worth knowing with what materials to clean the glass, types of cloths etc. After the cleaning came a stage in the process that I had not yet come across in my research but according to John is an essential stage in the process to keep the image fixed to the plate. This stage is running a solution of egg white water and formaldehyde around the edge of the glass plate. After this is applied it is left to dry. As I had had some practise in flowing the collodion I was impressed with my own ability to cover the plate now without ripples or spills. I also discovered it was good practise to keep a separate bottle of ‘used’ collodion and ‘used’ varnish, this is to be filtered later as it is no longer pure and could effect the surface and quality of the plate. Another tip I discovered at this stage was that coffee filters were a good method of straining the chemistry and that it is good practise to strain chemistry of foreign particles after each usage. The plate was the sensitised in the silver bath, which can be submerged in a light room as long as the box itself is light tight, it is not until you take the plate out to place into a camera that the glass becomes light sensitive and dark room conditions are necessary. Once in the dark slide there is now a 20 minute window to expose the plate and develop it before process expires. Once exposed there is a quick dash back to the darkroom to pour only a very small amount of developer very quickly over the edge of the plate. This part of the process is the part that I found the most difficult, pouring at speed at and angle a small amount of liquid that if stays too long on one area removes it and if it doesn’t cover all the surface leaves patches undeveloped. It was a great feeling to get a good coverage of the developer and watch a ghost like negative begin to appear. 15 seconds is the optimum time to leave the developer before pouring a substantial amount of water over the plate to stop the development. A tip here is to wash until the surface no longer appears greasy. The fixing is the part were most people reactions very evident, it is the big reveal of the level of success of the image. And by this time the level of commitment you have to the piece leaves you with a yearning to get a good result. As if by magic the fix reveals the image, as a negative on clear glass and as a positive on dark glass. 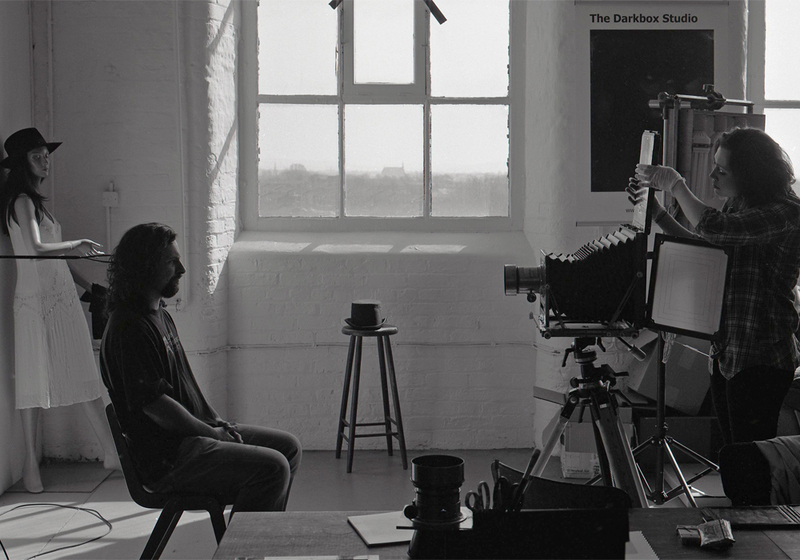 The reactions including my own were of wonder, Alan Duncan and experience photographer referred to hits first experience with Collodion to having the same level of awe and wonder as with the moment he developed his own film, a feeling I am sure most photographer’s can relate too. 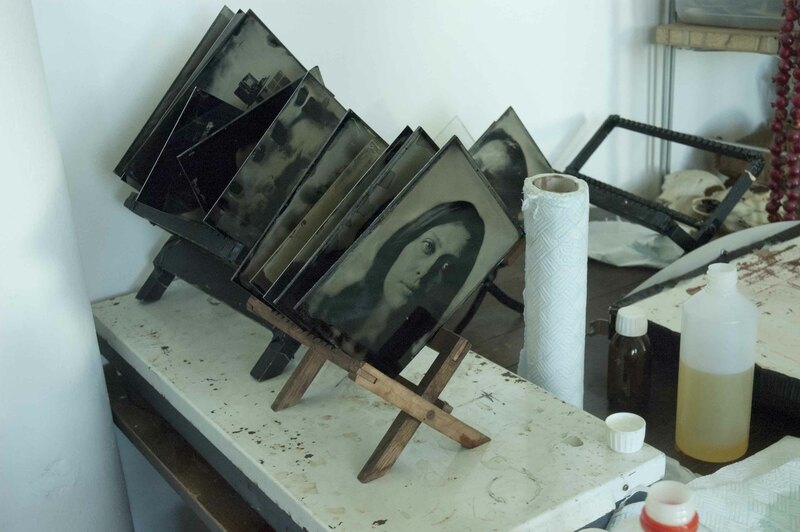 Before the Collodion images are ready to be used for what ever purpose they must be protected with a varnish to protect from scratches and oxidisation. This proved to be more difficult, as from my own experimentation, I already knew it would be far more difficult than the flowing collodion. This was sue to the viscosity of the varnish being much more similar to that of water. Images warming on hot plate before varnishing they need to be hot to the touch but not so hot as that they cannot be held. Curing the varnish with a blow torch. Images completed, left to dry in racks. The second day of the work shop John gave us the opportunity to use different surfaces to apply the Collodion, we used black acrylic and tin which is traditional called a ferrotype. Our final and for me one of the highlights of the workshop we were given the opportunity to use ruby glass 4×3 and the size and quality of the glass had a strange appeal to me. Portable Darkroom Testing// Take two. 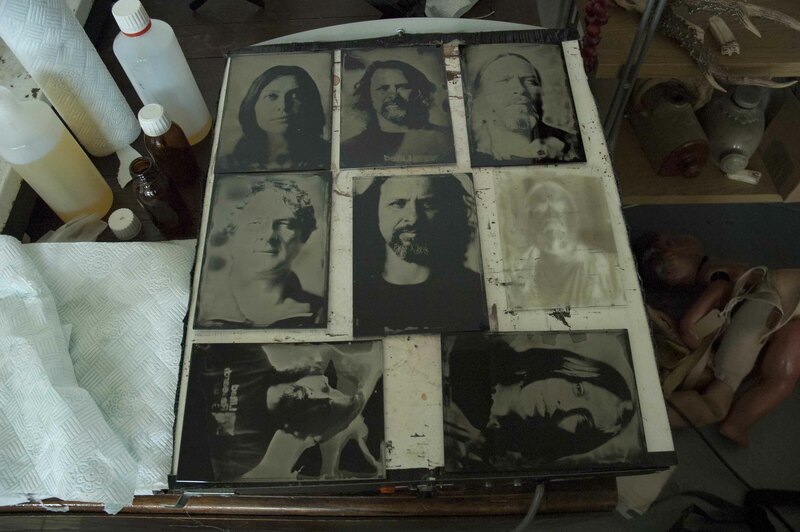 Collodion process: July 2012 amendments. Testing Variables: ESSEX// Back to the drawing board.